FUNDAMENTAL RIGHT OF ALL - in that it is recognised by religious and secular authorities, including the United Nations, as an 'inalienable' right of all people. DIGNITY - is a word that expresses the highest ideals of human nature. This is recognised in secular understanding (such as national constitutions) and in the language of spirituality (the 'divine' within humanity). 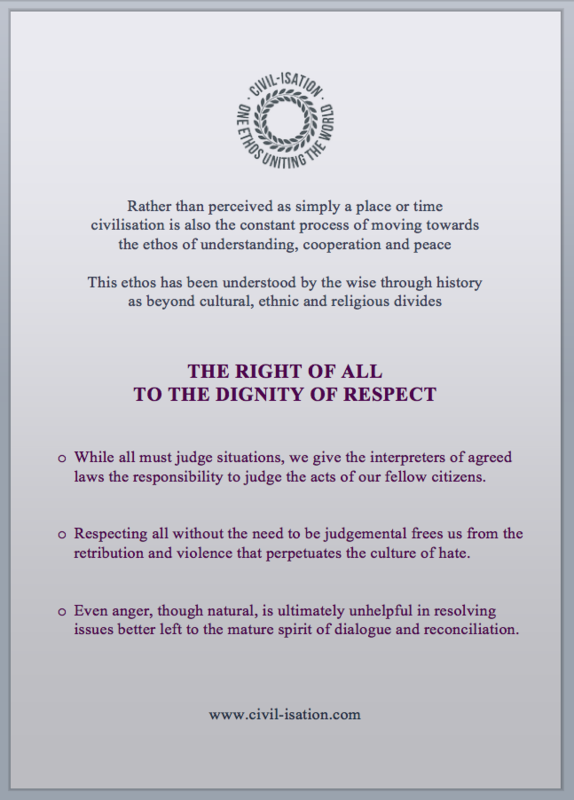 RESPECT - for all, then follows as the result of acknowledging and even cherishing the dignity of humanity. 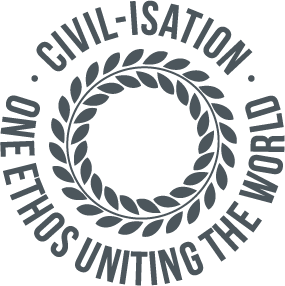 LINKING LIKE-MINDED - because of the need for those who recognise the simple ethic highlighted by CVIL-ISATION, to cooperate for the greater good. INDIVIDUALS - because CIVIL-ISATION understands that only through a personal 'revolution of the spirit' by each of us, can any greater change be possible in the world. OUR PERSONAL RESPONSIBILITY - because although we may at times feel powerless, each of us has an important part to play in how we live our lives and how that can affect society. DEMOCRACY - evolved from the understanding that all people had an equal right to effect change in society. But crucially, the idea relies on participation and inclusion by as many as possible and from all parts of society. EDUCATION - appreciating that the ideal of democracy cannot function effectively without the understanding that allows discernment and good judgement. ACTION - that while the ethos of CIVIL-ISATION is essentially about 'being' not 'doing', we recognise that without participation (from as much of society as possible), any recognisable change in the world is impossible. ACROSS THE DIVIDES - We have no chance to effect positive change without reaching out to others, especially those we struggle to understand. CULTURAL - While celebrating the variety and distinctiveness of different cultures, we recognise the importance of agreeing about the essential ideals we share. 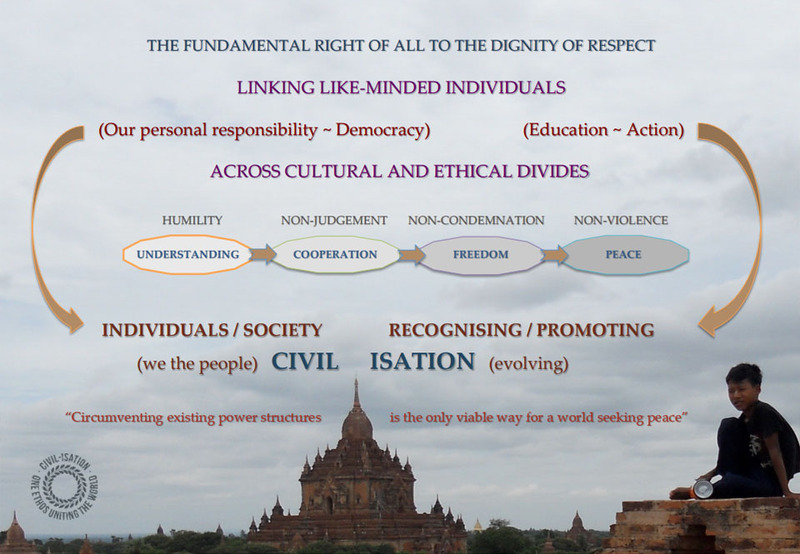 ETHICAL - As with any other recognisable distinction within humanity, everyone is afforded the dignity of respect. Modesty is considered vital for understanding those who are different from ourselves. But perhaps it is most important for accepting those you are unable to understand. While we accept the need to judge situations, it is with the ability not to judge people that understanding and cooperation becomes much easier. Other than a court of law judging the acts of our peers, if there is no need to judge there is no need to condemn. There is a progression of thought and action here which, when our humility stops us judging and condemning others, leads towards the state of peace. It is not a final destination but a life-long process of gradual cultural change. To presume it is not possible is to condemn us all to a hopeless existence. Of course society is made up of individuals and for it to operate effectively (and for us that means democratically), 'we the people' need to participate as much as possible for it to function healthily. Participating individuals make up the various civil organisations that keep democracies accountable. The 'CIVIL' in CIVIL-ISATION recognises the crucial role the individual plays in fostering a truly democratic society. Once we recognise this time-honoured ethic we are able to change ourselves. This might be the smallest appreciable alteration in our thinking. But many recognise that if we change our position even slightly, then all around us must also alter theirs. As mentioned before, this is an on-going process but one of the most powerful of realisations possible and usually considered an indication of true maturity of character. "Circumventing existing power structures is the only viable way for a world seeking peace." No society is truly democratic and the fragile ideal that is democracy has always been under threat. But meaningful change has always come from the people and it is only through mass cooperation that this is possible. The ultimate goal is a more peaceful world for all sentient life. would continue to be operative, posing a constant threat to the process of reform and regeneration. It is not enough merely to call for freedom, democracy and human rights. to resist the corrupting influence of desire, ill-will, ignorance and fear."